It has been decades since Bobby last saw his mother. Now, his sister calls, and he knows before she even speaks—the old woman is finally dead. He’d expected to feel nothing; but death, Bobby knows, has a funny way of surprising you. Now, after all these years, he leaves California’s sunny cliffsides behind and heads back to the blue mountains of Kentucky, where his buried memories lie hidden among the dogwoods. When Bobby’s wife Rebecca first finds his grandfather’s diaries in the dusty rooms of their family home, Bobby is hesitant—he’s learned the hard way to let the dead rest. But as Bobby reads more about his grandfather’s life in California during the depression, the more excited he becomes. 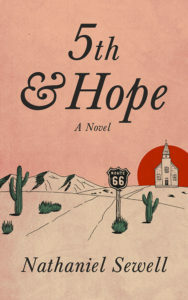 The old man’s words seem to hide some quiet, essential truth and, without really knowing why, Bobby finds himself driving Route 66 in his beloved 1929 Pierce Arrow, hoping to find in the Californian haunts of his grandfather’s past something to chase away his own lingering demons. But the road ahead is long and winding, and the forests of home are never as far away as they seem. The Appalachian looms on the horizon, and Bobby will learn that, sometimes, finding the truth means following your roots.